Looking back at Table’sUp it’s clear how much I love breakfast foods. Weekend brunch is one of my favorite things – although this is mostly to do with the leisurely pace of cooking and consumption! Beyond brunch on the weekends, I really do love eggs any time of day. They are such a versatile protein with the ability to play nice with really any ingredient or flavor profile. Also they are cheap, easy and fast to make! 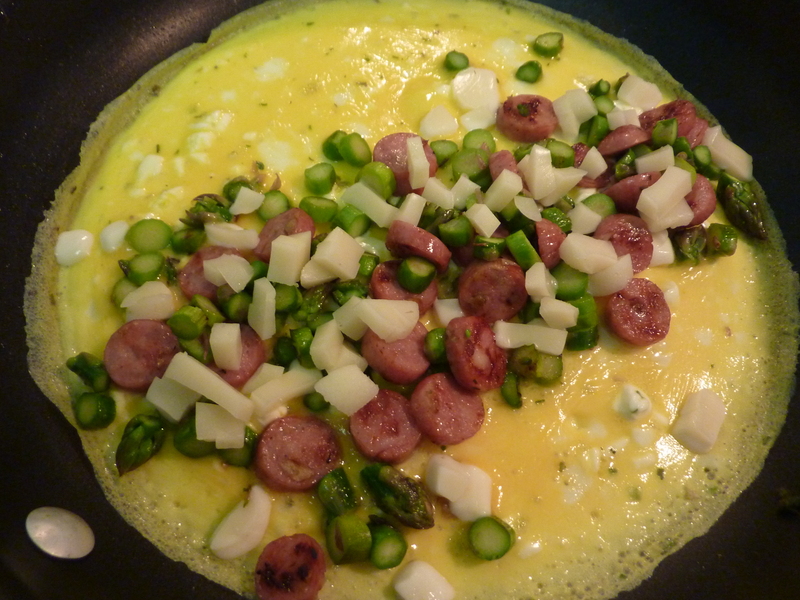 I think one of the best ways to make an outstanding egg dish is to flavor the eggs themselves. In this case I used cream cheese, although I often use a tablespoon of milk (or even water) for the fluffy effect without the creamy taste. Whipped cream cheese is also important if you don’t want any lumps in your eggs – although a little burst of cream cheese is really never a bad surprise! Penzey’s Sunny Paris Seasoning really is the all-star of my spice rack! It is fairly expensive but the difference it can make to any dish is totally worth it. It is a mix of freeze-dried shallots (main ingredient), chives, green peppercorns, dill weed, basil, tarragon, chervil and bay leaf. I have mentioned my love of chicken sausage before – let’s revise that to a love of mini chicken sausage! Although not as many flavor’s are available in the mini-version, their small size make them great for chopping and using in a greater variety of dishes without worrying they will break free from their casing. Also you can more easily choose your serving size using the mini variety (a serving is 5 links at 110 calories). Lastly, my favorite quick dinner trick – diced Laughing Cow Mini Babybel Light Cheese! It always seems to be the perfect amount of cheese with very little fuss. Warning, when melted this cheese gets very stringy so be aware if you mix it into something like a pasta stir fry – it has to go in at the very end or your pan will be a mess! 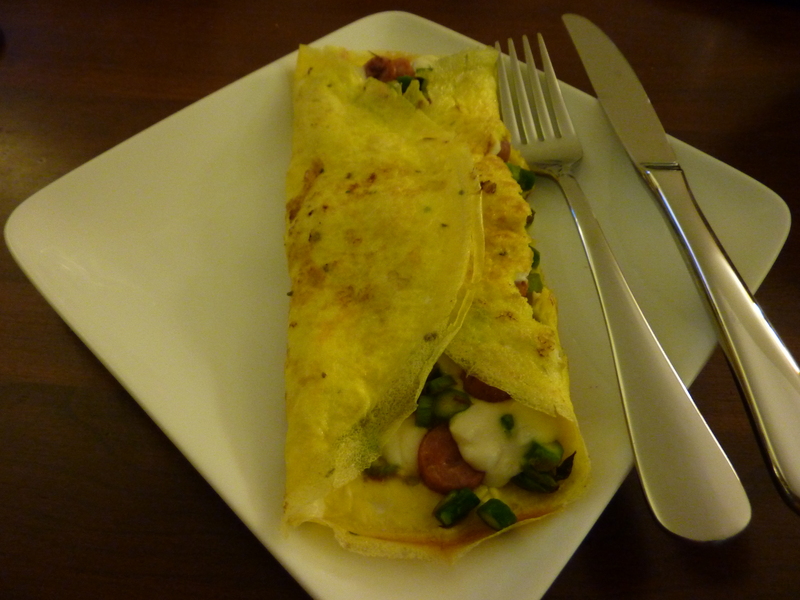 This entry was posted in Culinary Adventures, Tips & Tricks and tagged Brunch, Easy Dinner, Omelet, recipe, Sausage. Bookmark the permalink.